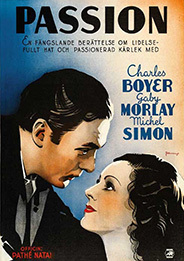 Marcel L'Herbier, one of the great innovators of silent cinema, never quite recovered his stride after the advent of sound, but among his high points in what otherwise was a long slide from an early pinnacle (L'inhumaine, L'argent) is this singular, genre-defying film that is as dark a tale of strange attraction as has ever been filmed. Aiding him in creating the dizzying story of an increasingly bizarre love affair between a brash, inscrutable anarchist (Charles Boyer, in a performance unlike any other he's given before or since) and a tempestuous, calculating diva (Gaby Morlay, demonstrating why she was the "go-to" actress in France for nearly half a century) is cameraman Harry Stradling, whose swooping pans, sideways tracking shots and oblique angles add immeasurably to the story as it shifts gears from melodrama to surreal self-referentiality. With Charles Boyer, Gaby Morlay, Michel Simon, Paulette Dubost, Jean Toulout, Jacque Catelain. The first great male presence in French film noir was not Jean Gabin, it was a middle-aged, washed up stage actor named Harry Baur. 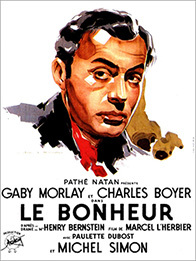 His larger-than-life persona, first revealed in his early 30s collaborations with Julien Duvivier, was leavened with the pathos of a not so well-concealed aching heart. He would ultimately die as a result of being tortured during the Occupation by the Nazis, who mistakenly thought he was Jewish. 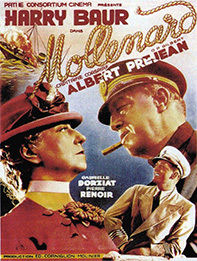 Mollenard is among his most fascinating performances: the macho, gun-running sea captain who is only at home when he's on the high seas turns out to have an Achilles' heel—his mutinous wife and family in Dunkirk, where he returns for what proves to be a fateful reckoning. Director Robert Siodmak, cameraman Eugen Shufftan and screenwriter Charles Spaak (the first two of whom would shortly flee to America) combine to make a noir as poignant as it is prickly. With Harry Baur, Albert Préjean, Marcel Dalio, Gabrielle Dorziat, Gina Manès, Marta Labarr, Robert Lynen, Liliane Lesaffre, Ludmilla Pitoeff, Lucien Coedel.